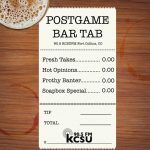 Postgame Bar Tab, hosted by KCSU’s Sports Directors Ray McGowan and Nick Baker, covers the latest news in the sports world. They cover all leagues from the MLB, NBA, NFL, AAF as well as college and local teams. Check for new episodes every Wednesday at kcsufm.com. This week, Nick Baker and Ray McGowan discuss the Chris Davis’ record-breaking season and the Antonio Brown and Juju Smith-Schuster drama. They also discuss what their dream line-up would be for the upcoming Space Jam 2. On this weeks episode, Nick Baker and Ray McGowan discuss the potential folding of the AAF. They also talk about Zion Williamson’s possible $100 million shoe deal as well as the ridiculous names of minor league baseball teams. Get ready, it’s about to get… toasty. In this week’s episode, Ray McGowan and Cory Odom discuss Rob Gronkowski retiring and whether he will be voted into the Hall of Fame. They also discuss Kyler Murray possibly going number one overall in the draft and how mock drafts can be misleading. On this weeks episode, Nick and Ray dissect the Bryce Harper contract and whether he made the right decision. They also discuss their ballpark food experiences, whether home “bowl” is a major key, and what Magic Johnson should do next for the Los Angeles Lakers. On this weeks episode, Ray and Nick talk about the buzz around the MLB. They give their opinion on the Manny Machado signing as well as the new Nolan Arenado contract. They also predict where Bryce Harper will end up signing with and the state of the Seattle Mariners. On this weeks episode, Nick Baker and Cory Odom dive into the AAF and their money problem. They also discuss Team Lebron vs Team Giannis as well as the brand new Manny Machado signing.